n 2004 Parker introduced the Vector XL and Vector 3-in-1. It was a fat, very stylized pen that had a moulded plastic barrel with a stainless steel section and chrome coloured trim. 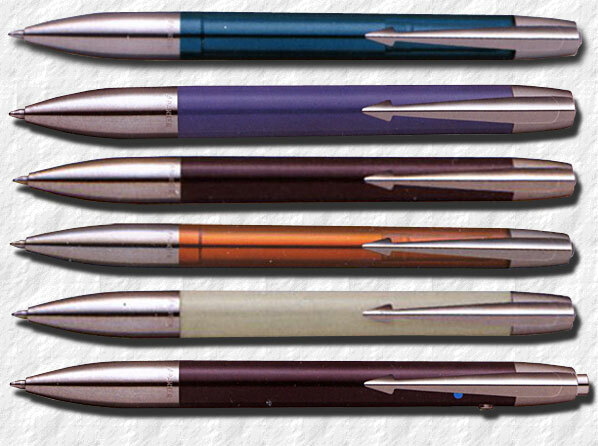 The Parker XL was offered as a twist action ball point pen. The Parker 3-in-1 was offered either with two ball pen colours, black and blue, and a 0,7 millimeter pencil, or as a blue ball point pen, pencil and pda-stylus. It was operated with a cap button to actuate writing mode and a side button to retract. It had a simple, stylised clip reminiscent of the 1930's Parkette and Duo-tone. In 2005 the line was enhanced with two new body colours, Cool Water and Crystal Amber, these two were offered as gel-pens only, while The Indigo now was also offered as a 3-in-1. n 2006 the XL and 3-in-1 was batched together as the I.M. (in the US) and the Profile (in the UK). IM stands both for "Instant Message" and according to Parker, it can also be read as "I'm", for a very personal pen. It has also been referred to as the Vector MkII. The I.M. was now also offered as a fountain pen and roller ball. This line-up remained until 2008.
n 2009 the Parker I.M. was redesigned. The stylized arrow clip was removed and replaced with a sleek clip with fins and a very narrow end-arrow. The clip screw was still wide and tapered with the clip a bit lower down on the body. The cap ring was wider and the fountain pen and roller ball had an additional ring at the end. The ball point and pencil was now button actuated, the pencil taking 0.5 millimeter leads. The 3-in-1 was discontinued. It was made from laquered brass with brushed metal section. lready in 2007 200 workers at the Newhaven factory had been made redundant and parts of the production were moved to Shanghai in China, mainly ink and Jotter assembly. These pens lack the "Made in"-imprint. When the Parker Newhaven factory was finally shut down in the Autumn of 2010 the complete production range had moved to the Waterman factory in Nantes and to Shanghai. The Premium range was the first design solely manufactured in China; Premium Jotter, Premium Urban, Premium Vector and Premium IM. The IM Premium was offered in three finishes on laquered brass, highlighted by chrome coloured trim. Fountain pens, ball pens and roller balls were manufactured. Parker I.M., aka Profile aka Vector mkII aka Parker XL in Cool Water, Royal Blue, Amarath Purple, Crystal Amber and Silver Grey. Last a Parker 3-in-one in Amarath Purple, 2008. New Parker IM, Gun Metal, 2009.